I thought of you when they won. I thought, "Oops, there goes French Pony's stress-free existence in Chicago on Super Bowl Sunday...."
At least there's just one Sunday of madness left. On the other hand, if they end up playing the Patriots, then the Super Bowl will be a happy thing. The Patriots are my birth team, the Bears are my adopted team. Whoever wins, I'll be happy. Any connection to the Care Bears? The Chicago Bears just tromped the New Orleans Saints, thus securing themselves a place in the (choir of angels) Super Bowl. Grid willing, they'll find some other place to play than the spaceship on the Drive. As you may have guessed, I'm not the world's biggest football fan. I much prefer baseball. And flower-arranging has always seemed to me one of the most pointless activities invented by mankind. Chicago Cubs: National League baseball team, near and dear to Pony's heart, and the source of much pain and suffering, as they are perennial losers. Haven't won a World Series since 1908, haven't even seen the Series since 1945. They got thisclose in 2003, which is why we hates the Florida Marlins forever. Boston Red Sox: American League baseball team. Also near and dear to Pony's heart, but definitely nearer and dearer to that of jastaelf. They used to be perennial losers on the order of the Cubbies until 2004, when they absolutely spanked the St. Louis Cardinals to win the World Series. There was much rejoicing in Grad School Town that night. New York Yankees: American League baseball team. Source of all evil in the world. Their General Manager eats the likes of Sauron and Morgoth for breakfast. New England Patriots: Football team. Since I am originally from New England, I kinda sorta root for them. As in, I occasionally notice their existence, and am vaguely pleased when they win the Super Bowl. Which they do on a fairly regular basis, although they don't seem to be in it this year. Chicago Bears: Da Bears. Chicago's football team, and the source of mild Pony grumpiness. Da Bears aren't known for being consistently good, but this does not prevent Chicago from loving them (hey, we also love the Cubs). 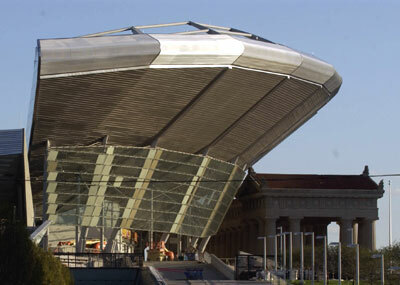 On their account, King Richard II authorized the spaceship to be built for them in Soldier Field, previously a rather classy stadium on the lake shore. My main relationship with Da Bears is perpetual annoyance when they play in town, because their fans foul up traffic on Lake Shore Drive, making it difficult to get anywhere on a Sunday afternoon. mr. rhobike tells me they will be playing in miami, thus not fouling up traffic for people trying to join us at the Lincoln's birthday singing. Oh, good. 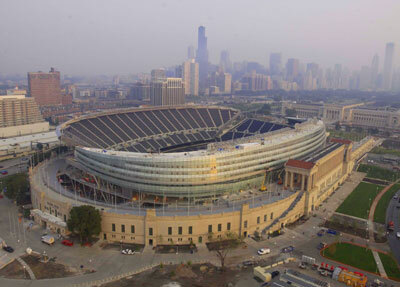 Da Bears can enjoy the warm weather, people with televisions can enjoy the game, and we can have our city to ourselves in peace. Everybody wins. Is the Lincoln's Birthday Singing on the Super Bowl? The actual game is in the evening, so not exactly a direct conflict. But I'm predicting many empty seats at the folk fest evening concert. You do what you can. At least one of my local sports teams is making good.